The course is very similar to last years with the trails dry and improving daily. The 60 is a tough ride, you will earn that Fat Point beer at the end. The course is set up to have several challenging sections followed by easier areas allowing for some recovery. You will start from the Pavilion, after a brief neutral section you will ride a grassy double track until you pass a picnic table and go around a gate to reach the Border Road extension which is 2 1/2 miles of gravel road. There are three gates which all have a bypass on the left side. No need to open or climb the gates, there might be cattle in the area so if you open it close it. A left turn and a swing gate gets you onto Doe Hammock which is a grassy section connecting to the south Powerline, a 3 mile gravelly section, another short grassy road followed by asphalt and then a right turn back onto the Powerline after going around the gate. The most challenging section of the race follows between mile 12 and 20 where you will ride the River Trail and the Stockade Trail. This will test your power and ability to find the right line. Local riders know that at the Carlton it pays to look for a better line sometimes the right path is just a foot or two to the right or left of your current track. Next will be 4 miles of gravel road and before you know it you will be 25 miles into it and at Tom and El Jeffe’s Oasis SAGG Stop. After a little bit of recharging, you are off down the Venice Arcadia Grade which is a fast double track road going through the area of last month’s bear sighting. The end of the VA grade is called the mile of HELL, enough said. Right turn onto the North Powerline is a mix of grass and gravel and near then end is one gate that you will have to climb over. You’ll ride further on and take a right turn onto the mowed track running along Big Slough. If you cross a rusty metal bridge you missed your turn. The section along the Slough is very scenic, look up! LEFT onto the South Powerline but only briefly, you cross the bridge then take an immediate right turn down the bank and into the Myakkahatchee Environmental Park. Go over a small ditch crossing then into the park proper where there will be park visitors so be mindful. Cross the wooden bridge and follow the creek on the right side. There is a water source near the parking lot (white pipe sticking out of the ground). You will be riding a grassy/sandy trail then you cross Tropicaire Blvd so go slightly toward the bridge and down the bank across the street. You have 2 miles of ATV trails next which were very nice this week but can get sandy. There are two trails that run parallel to each other watch for illegal ATV and Motorcycle riders. Follow the trail UNDER the freeway and then take a left onto some paved but poorly maintained roads for the next 2 miles. 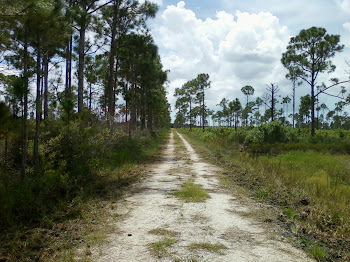 Back onto the ATV trail for a short distance then across the Myakkahatchee Creek and up the sandy bank. You will reach a road, go past the house then turn down the right of way on the left side of the house till you get to the dam. You can ride or walk this section because it can be slippery at the bottom. Go left onto the gravel access road and a right at Sumter Blvd, ride the sidewalk. At mile 43, the intersection of Price and Sumter, you will find several options for resupply (Publix, restaurants, 7/11, etc.). After that break, ride more sidewalk down Price Blvd. until you cross the Myakkahatchee Creek for the last time on a pedestrian bridge. After the bridge, cross Price into the parking lot of the Sport Complex and ride past the buildings and then go left behind the Middle School which takes you to a grassy/gravelly road. At Pan American, the 5 mile road section begins. These are back roads with little traffic the busier roads will have a bike lane. Pan American will take you to Avanti and eventually to S. Biscayne Take a right on Trionfo, past the Warm Mineral Spring Complex to De Leon Drive and De Miranda Ave till you reach HWY 41 but only for a short section. Next is the entrance of Deer Prairie Creek Preserve, a mile and a half of gravel with a water crossing. Go left onto a grassy double track followed by more gravel then another road section will get you across HWY 75. The end is near as you reenter the Carlton Reserve with one more gate to go around with more grass and next thing you know you will be smelling the grill and finishing. This course will play well with riders that work together so take advantage of the sections where drafting can be a big factor. Cross bikes would work best with this tactic but there is a price to pay and you will get beat up in the bumpier sections. A 29r will ride smoother but will be hindered on the fast rolling sections. Also stay on the route the temptation to cut out tough sections or take shortcuts can be pretty strong but it’s cheating in my eyes. If you can’t do the ride as designed maybe you need to find another sport where cheaters get rewarded.